Can you identify these women? 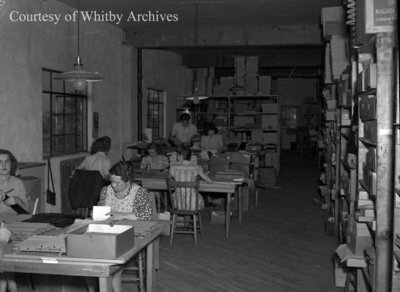 Black and white negative showing a group of female employees assembling boxes in the William J. Anderson Company at 600 Euclid Street. The women are seated at tables. William J. Anderson Company, October 17, 1947, Marjorie G. Ruddy. Whitby Archives A2013_040_452.